Before root canals became readily available, often the only option to resolve an issue with a deeply infected tooth was to have the tooth extracted. Thankfully, modern dental technology makes it so that for many tooth infections we can use root canal therapy to help get your oral health back on track and provide tooth pain relief. Pacifica, South San Francisco and other cities in our area have a lot of different dental options available. Tooth sensitivity: Although just having sensitive teeth is not always a sign of needing a root canal, if you are experiencing tooth sensitivity along with any of these other symptoms, you may want to get your teeth checked to see if you need treatment. Severe and/or Chronic Toothaches: If your tooth has developed severe, recurring, or chronic toothaches, it may be a sign that it is battling a deep infection. Root canals can help relieve these symptoms. Swelling: If you are experiencing swelling around a tooth, it can indicate that your tooth is attempting to fight off an infection and may need a root canal. Dr. Hovden can help you determine if the swelling you are experiencing may need root canal therapy. Abscess: If you have developed an abscess near a tooth, often this means that an infection has moved deep into your tooth, and can result in tooth discomfort, decay, and more. 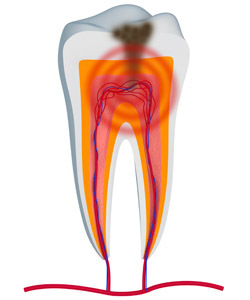 At Kenneth Hovden DDS we can help you fight this infection and receive tooth pain relief. Pacifica and South San Francisco residents and other areas are welcome to come to our office for abscess diagnosis and root canal treatment! If you have a deep tooth infection that needs treatment, a great treatment option truly is root canal therapy. San Francisco patients are welcome to come to Kenneth Hovden DDS for root canal treatments and tooth pain relief. If you have questions about root canal therapy or would like to schedule an appointment, give us a call today at our Daly City office.